Whether you’re a Fortune-100 brand or a one-person business, choosing which platforms your mobile app will support can be a confusing process. The past few years have seen the rise of Windows and Blackberry app markets, but for most businesses looking to build a mobile presence the choice comes down to the two major platforms: Android and iOS. To clarify: if you are just breaking into mobile, it may not be madness to begin by only supporting iOS even though it controls just 15% of the global market as compared to Android’s 78%. But to rule out Android support completely is to ignore a huge potential source of users and revenue. The key question to ask yourself is how much you plan to charge for your app. Despite Android’s huge lead in global market share, Apple pulls in an estimated $5.1M a day in App Store revenue, compared to Google’s daily $1.1M from Google Play. That means that the average iOS user spends roughly 25x as much on apps (and in-app purchases) as the average Android user. So if you plan to release a paid app, it may make sense to start by allocating your development resources to a quality iOS release rather than splitting your budget between parallel iOS and Android builds. At OysterLabs we’ve worked with many clients who went that route and then re-invested a portion of their iOS app earnings into a follow-up Android release. For cash-strapped businesses and startups in particular, this is a time-tested approach that may not yield huge revenue right off the bat but almost certainly won’t break the bank. Not everyone is interested in the paid app model, though. Businesses whose apps rely on in-app purchases, ads, and/or incentivized downloads for revenue may see Android as the priority platform given its much larger user base. If your app’s revenue model relies on many users downloading and using your app – what industry insiders sometimes call “eyeball potential” – then it makes sense to prioritize support for the platform with more users. But that raises a secondary question about how to get those eyeballs focused on your app. Big brands can rely on their marketing budgets to drive installs and impressions, but less well-endowed developers often must resort to clever usage of social media and paid distribution channels. Google Play offers an advantage to the small guys here with its superior search capabilities that enable users to find apps even when they misspell keywords. Your decision-making about mobile platform support should be driven by your app’s revenue model and available budget for development and distribution. 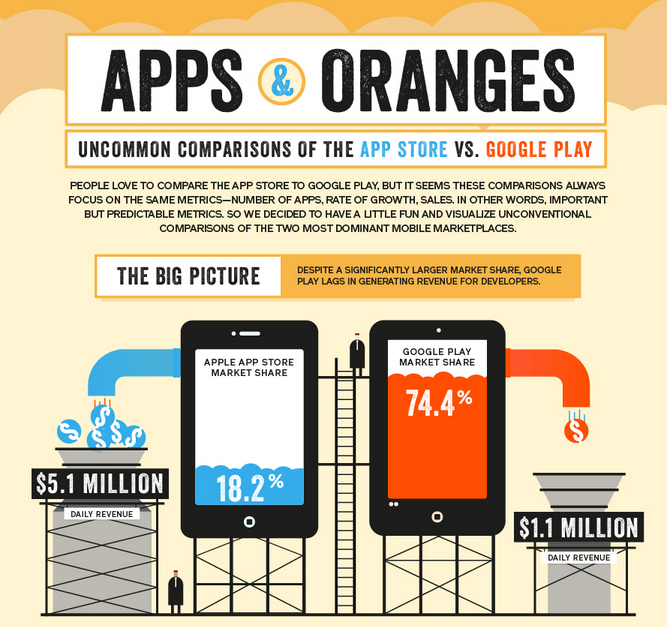 The ideal scenario is to support both iOS and Android, but that may not be a reality for every business at the start. If you’re thinking about developing an app, give us a shout at Hello@OysterLabs.com and we’ll help you develop a mobile strategy that meets your business’ goals and requirements.